Since the self recovery tool (Ramsey REP8000 winch)has been placed on the front bumper of the Explorer, now it is time for me to look for all the necessary items that will support my winching a smooth operation. I have been going through the information provided from various Winch manufactures, especially the www.warn.com decided to add few items to the already available recovery tools bag. 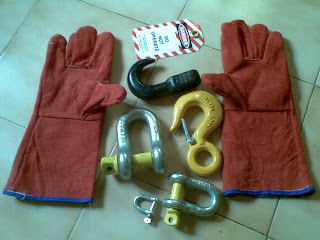 Now the D Shackle (few different tonne collection), additional shackle hook, leather hand glove to protect my hands from damages during winching operations and "Do Not Operate" tag (small plastic plate that caters to stop anyone operating the winch accidentally when I'm doing some thing on the other side of the winch. I also managed to fabricate a spacer to replace the Mahindra Classic original front chassis tow hook, it was removed to accommodate the winch platform earlier. 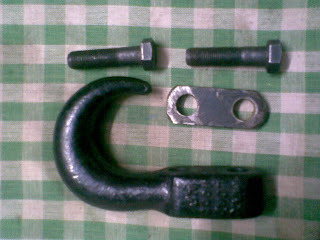 As the platform increase couple of millimeter thickness and the mounting plate's bolt also came in front of the tow hook, we had issues in tow hook fitment. Now the spacer has solved the problem by providing extra height. 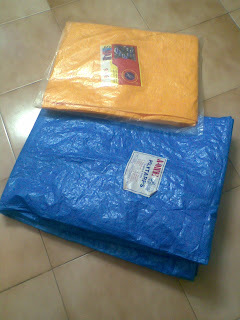 PVC Mat to be used as Work Mat for under Jeep body works and Trailer cover to protect the goods placed on the trailer has also been added to the recovery bag.